I just received Nokia's announcement of its 5.44 billion euro all-cash transaction with Microsoft under which (once closed) "Microsoft will acquire substantially all of Nokia's Devices & Services business, including the Mobile Phones and Smart Devices business units as well as an industry-leading design team, operations including all Nokia Devices & Services production facilities, Devices & Services-related sales and marketing activities, and related support functions". "Today's news puts at rest doubts expressed by some that Microsoft would walk away f[ro]m smartphones. If this isn't commitment not sure what is?" "Under the terms of the agreement, Microsoft will pay [...] EUR 1.65 billion to license Nokia's patents [...]"
"Nokia will retain its patent portfolio and will grant Microsoft a 10-year non-exclusive license to its patents at the time of the closing. Microsoft will grant Nokia reciprocal rights to use Microsoft patents in its HERE services. 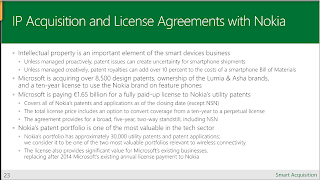 In addition, Nokia will grant Microsoft an option to extend this mutual patent agreement in perpetuity." "As part of the transaction, Nokia will grant Microsoft a 10 year non-exclusive license to its patents as of the time of the closing, and Microsoft will grant Nokia reciprocal rights related to HERE services. 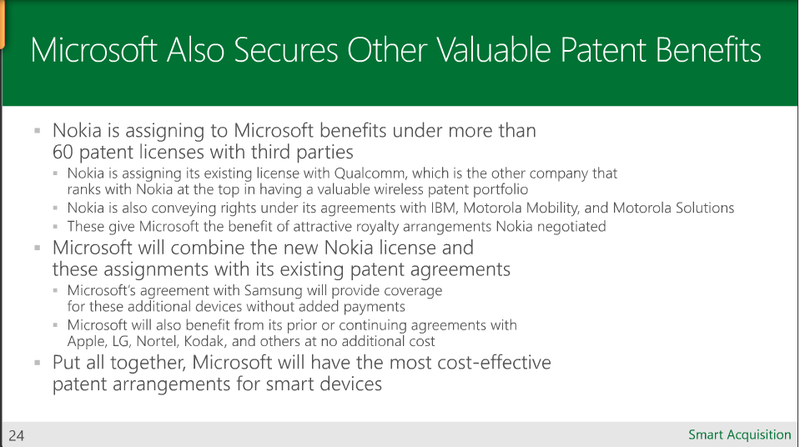 In addition, Nokia will grant Microsoft an option to extend this mutual patent agreement to perpetuity. Of the total purchase price of EUR 5.44 billion, EUR 3.79 billion relates to the purchase of substantially all of the Devices & Services business, and EUR 1.65 billion relates to the mutual patent agreement and future option." "As part of the transaction, Nokia is assigning to Microsoft its long-term patent licensing agreement with Qualcomm, as well as other licensing agreements." 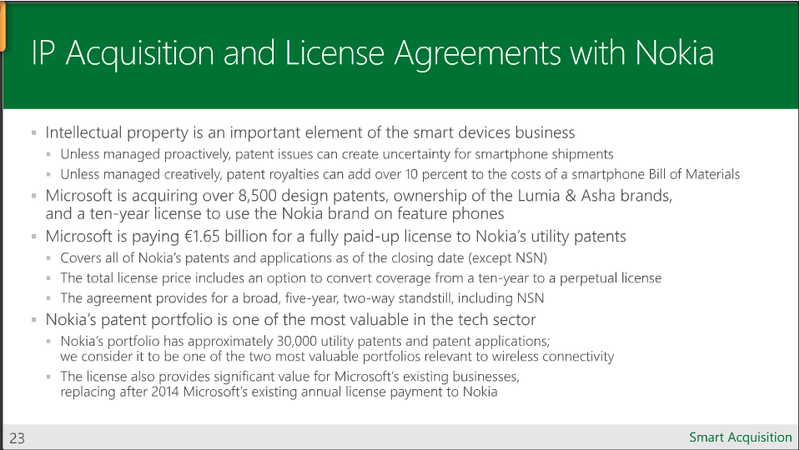 The fact that Microsoft would pay EUR 1.65 billion (almost $2.2 billion at the current exchange rate) for a 10-year license (including the option for a future extension) is a boost for Nokia's patent monetization aspirations. And Nokia's patent monetization -- which I've been watching (particularly the related litigations) for some time now -- will obviously continue. Other prospective licensees will deal with a company that is financially strengthened by this deal and can point to yet another "blue chip" licensee that has recognized the value of Nokia's portfolio. Obviously, Microsoft could also have acquired that whole patent portfolio. 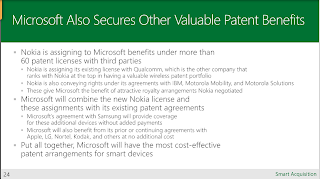 But Microsoft already has an extremely strong patent portfolio (it simply has the highest "hit rate" in court of any smartphone-related litigant and has convinced 20 Android device makers of the need to take a royalty-bearing license, 19 of them without any litigation). That's why Microsoft -- unlike Google, which owned hardly any patents when it announced the Motorola deal more than two years ago -- didn't have to shore up its portfolio. It's predictable that the markets will continue to speculate about potential M&A transactions involving the businesses and assets Nokia retains, including its patent licensing business and the related portfolio. I'm not going to engage in any such speculation, but assuming for the sake of the argument that a third party subsequently acquired Nokia's patent portfolio, I guess it wouldn't change anything in strategic terms for Microsoft. If someone bought those patents and stepped up enforcement, Microsoft and, by extension, Microsoft's customers (to the extent that they redistribute Microsoft technologies) wouldn't have to worry about it. In closing I'd like to point to another structural difference between the Google-Motorola deal on the one hand and the Microsoft-Nokia deal on the other hand. The "Googlorola" break-up fee was $2.5 billion, reflecting desperation as well as concerns over antitrust approval. By contrast, today's announcement says that "[t]he transaction is subject to potential purchase price adjustments, protecting both Nokia and Microsoft, and a USD 750 million termination fee payable by Microsoft to Nokia in the event that the transaction fails to receive necessary regulatory clearances", which is a pretty standard level for such a fee, especially relative to deal size, while, compared to transaction value as well as in absolute terms, the Google-Motorola fee was extraordinarily high. There can be no doubt that today's deal is one of the most pro-competitive M&A deals in the history of the information and communications technology industry: consumers, wireless carriers, app developers and other stakeholders don't want the smartphone business to become a duopoly.